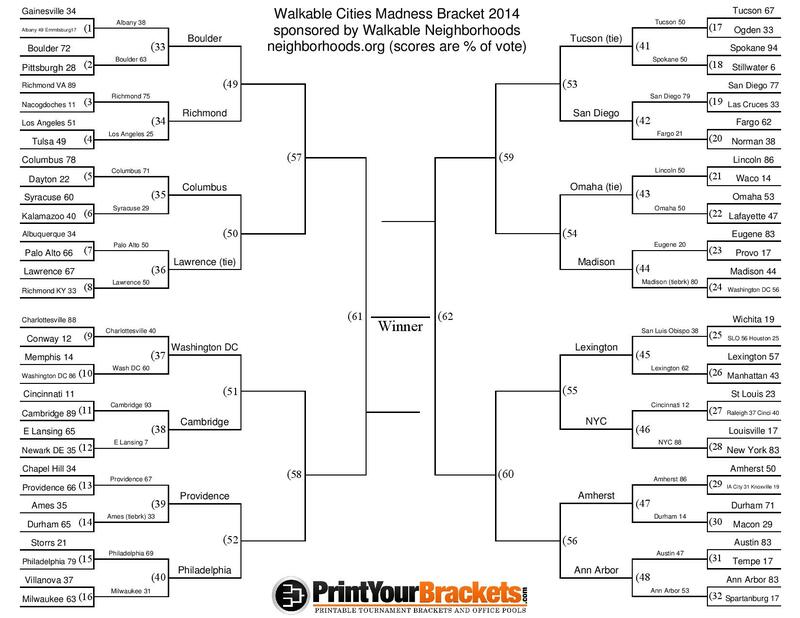 Voting is now open for the Sweet Sixteen of our Walkable Cities Madness Bracket. Yes, I know we are a bit behind the men’s tournament, but I had to squeeze in a vacation to Phoenix and Tucson. If you’re curious what this is all about, read the first post. Speaking of Tucson, having just visited, I’m a bit surprised it beat Spokane on the tiebreak in the last round–even though I’ve never been to Spokane. Tucson is a leader in complete streets and transit innovations…but now I realize why. Unfortunately, it’s out of necessity to combat streets and land uses designed for driving. Also, really cool that the Battle for Nebraska ended in a tie! Omaha moves past Lincoln on the lower seed number tiebreak. It also means that the West is the only region to hold chalk. At least for now. 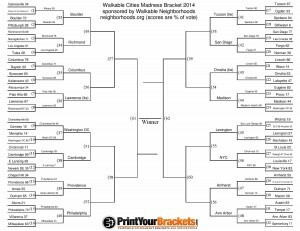 There are some fantastic head to heads this round: Cambridge versus Washington DC, Columbus versus Lawrence, Providence versus Philly… so make sure to vote below. It only takes 9 clicks this round! Thanks to everyone that has voted thus far. Keep the votes comin’!! If you have an interest in taking or teaching walkable neighborhoods related training courses, sign up for our interest list by clicking here. I don’t know if you’ve checked out Sandpoint, Idaho. It’s beautiful and they have a big sign that says they are the walking city.